Nan Porter said that, not me. So true for most cats, but not a Siamese. I was remiss in my duty as cat-parent because I didn’t mention the recent birthday of Scout when I was writing about green soap and vegan vegetable pies. Born in Burlington, Ontario on March 17, 2007, she is a St. Patrick’s Day baby, which is truly in line with her Egyptian heritage. 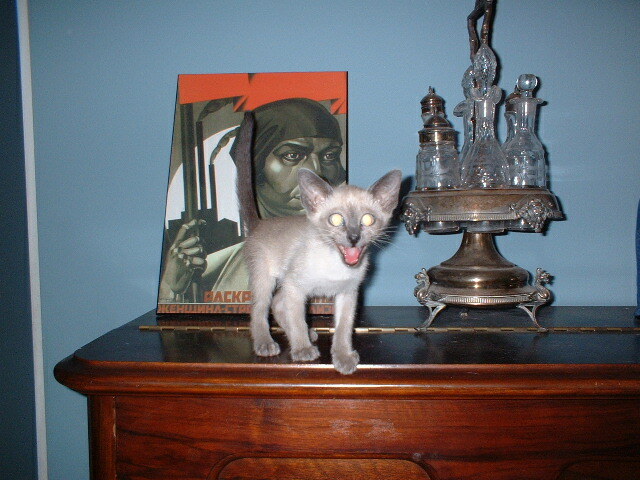 I remember wanting another Siamese cat. 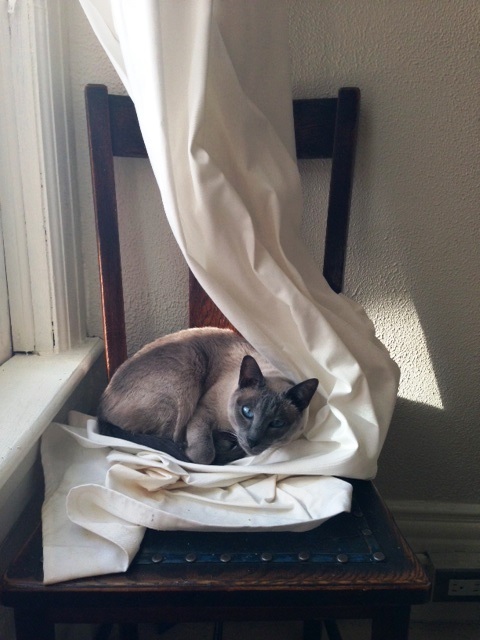 Our old girl, Emma, a tortie-point Siamese who looked like someone threw chocolate cake at her head, had tragically passed away at 17. After being diagnosed with kidney failure she lived another two years in relative comfort via nightly subcutaneous injections of lactated ringers. In short, the grand dame had to be rehydrated. During that period her mate, Molly, a beautiful tortoishell-and-white, also died of kidney disease. Her little heart gave out very quickly after we found out she was sick. We were prepared to say goodbye to Emma, but not to Molly. We didn’t have time. By the time we adopted another Siamese a year later, we already had another tortoiseshell by the name of Stella. A real beauty, she’s now nine and is a gentle soul. She had come into our house of three rambunctious dogs and after a night of trying to protect her from them by keeping her with us in our bedroom, we found her in the morning sitting on the living room floor, while all three dogs danced around her begging for their breakfasts. We knew Stella would be just fine. 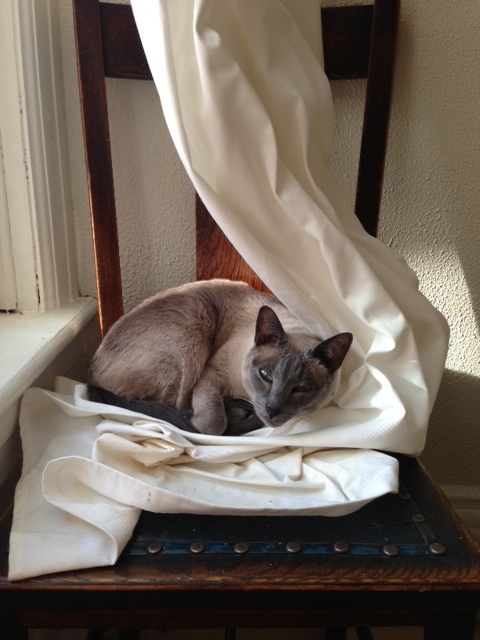 We wanted our new Siamese to be just fine too, which required a strength of personality that not all cats have. She needed to be bold, but not nasty. 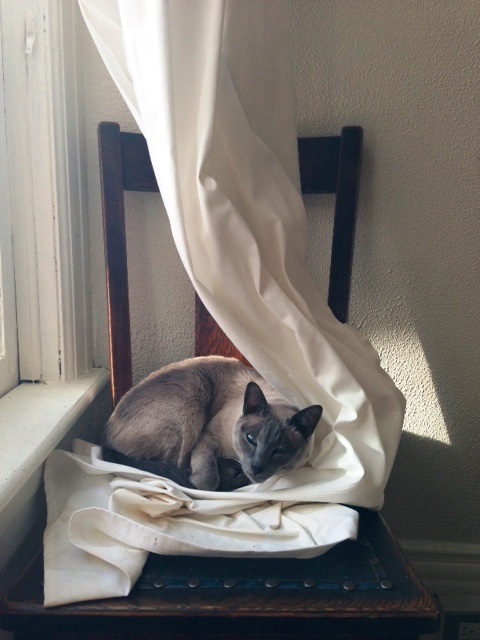 When I had first met Emma, who had been born on Victor Avenue in Riverdale so many years earlier, what sold me on her was not her looks (she wasn’t the prettiest Siamese), but her big personality. While all of her littermates were fast asleep after a meal, she climbed out of the box and walked straight toward me, intent on meeting this new stranger. I was instantly smitten. While watching a roomful of blue-point Siamese kittens running around in front of me many years later, I knew I wanted another Emma. I wanted one to walk up to me, but none did. Instead, a little wisp of a creature ran around after the woman, mewling piteously and trying to get her attention. 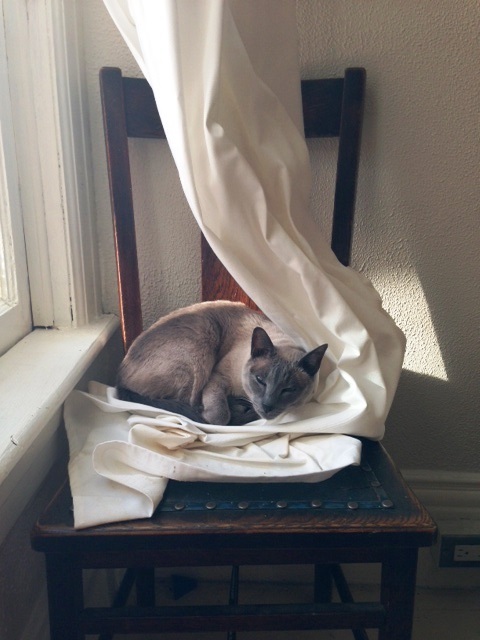 Typical Siamese. I wanted that one. Scout has never really grown up and still needs to be with people at all times, mostly me. Like many of her breed she needs to be the centre of attention. Six years later she still follows me around the house. At night she walks down the hall toward our bedroom, announcing her presence loudly and nasally into the night. She can throw her voice as well as Peter O’Toole and doesn’t stop until she falls asleep. This insomniac has fantasies about throwing my shoe at her, but how do you tell a cat that she needs to use her nighttime voice? Scout, trying to sleep. Just like me. 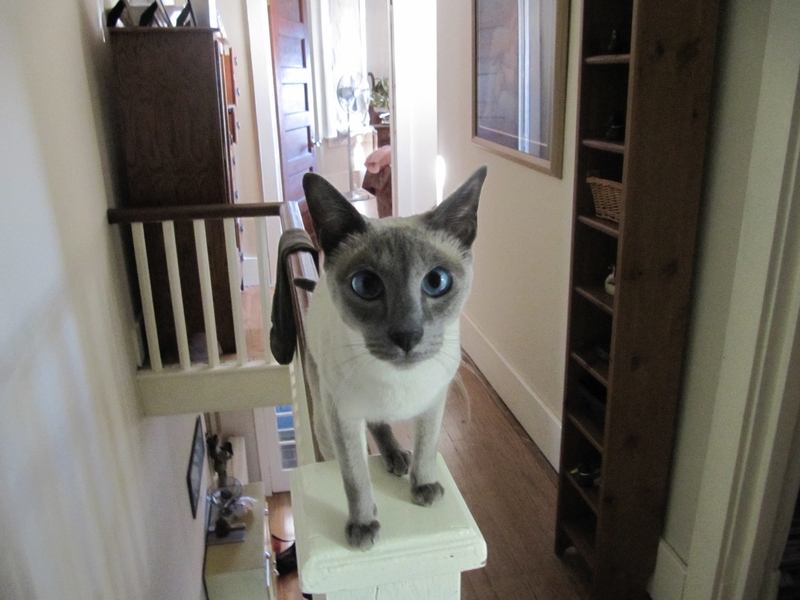 This entry was posted in Animalia, Ramblings and tagged blue point siamese, guilty vegetarian, siamese cat, tortie-siamese, veggie by budbug. Bookmark the permalink.